Just in time for Computex 2014, Intel has officially announced the release of new unlocked 4th generation processors – code named Devil’s Canyon. Our review sample hasn’t arrived yet, but we expect it any day now. When we get our hands on it, we’ll be sure to run it through the paces and provide you with the much anticipated performance numbers. Until then, we’ll share what we learned during our recent teleconference with Intel and hopefully, answer many of the questions that several months of rumors have undoubtedly generated. 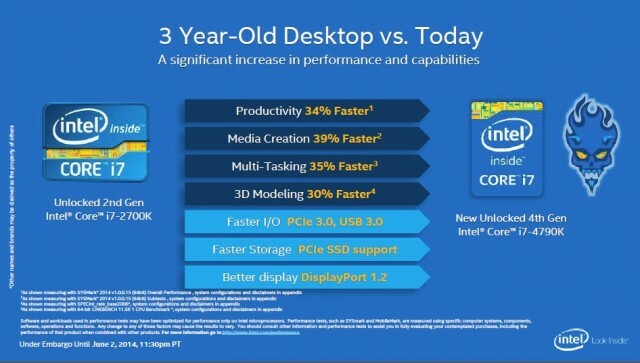 Before we get into the particulars of the new Devil’s Canyon CPUs, it’s worth taking a few minutes to relay what Intel’s desktop client platform division has been working on and their take on the current market demands for desktop PCs. Contrary to the doom and gloom predictions regarding the future of desktop computing, Intel has numbers that show an upward trend in demand. According to the figures below, desktop units and the dollars spent on them have increased 16% and 7% year-over-year, respectively. 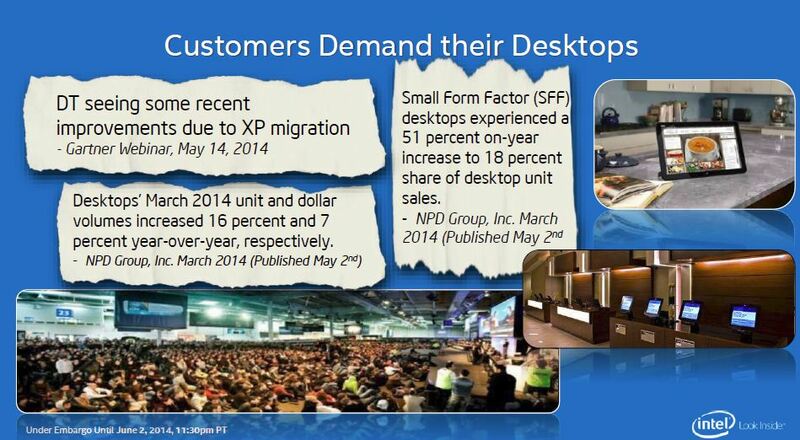 Leading the way in this upward trend is the increasingly popular Small Form Factor (SFF) desktop. 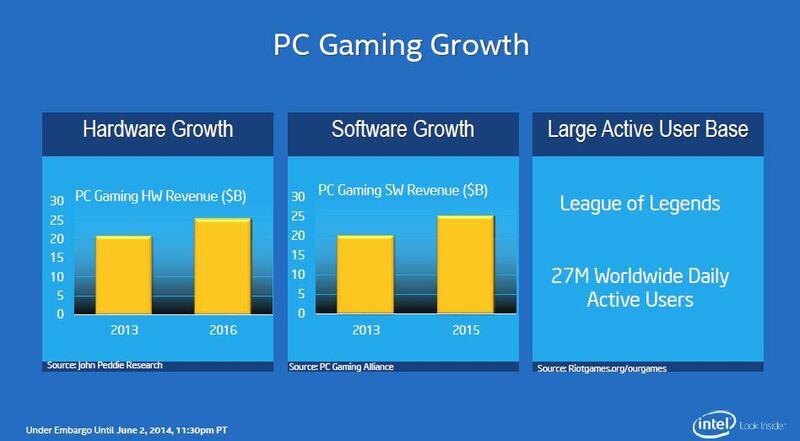 PC hardware and PC gaming software sales are on the rise too, as witnessed by the second slide below. Looking at just a single game title (League of Legends) and its 27 million daily users, it’s easy to see that gaming is alive and well on the PC. Portable and stationary all-in-one PCs are becoming more popular as the cost of these units continues to fall. 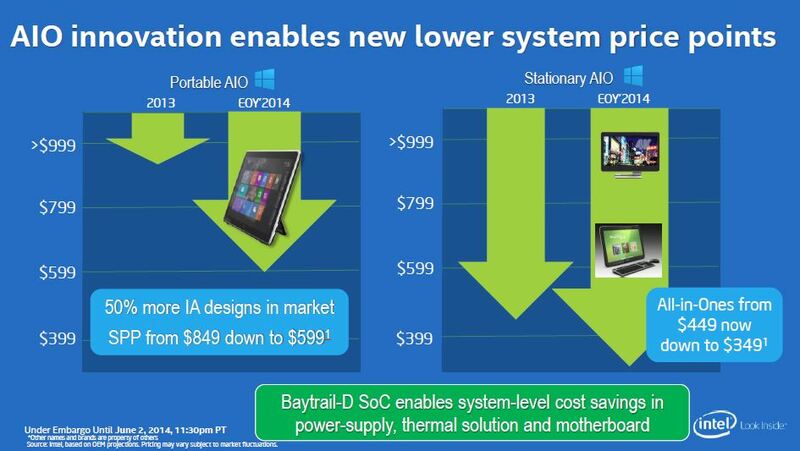 SoC (system on chip) innovations allow system manufacturers to lower costs by reducing the need for expensive power supplies, thermal solutions, and motherboards. 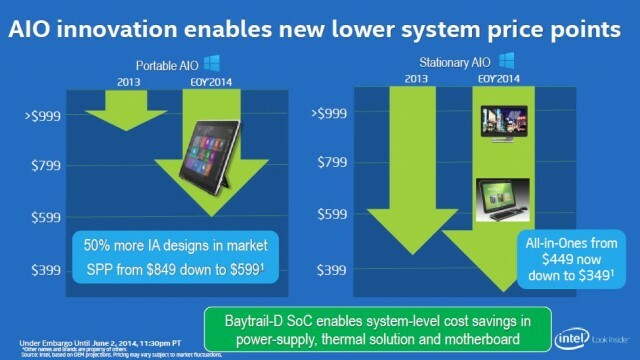 Intel states that systems outfitted with their Baytrail-D SoC processors have had a dramatic impact on reduced pricing for these types of systems. 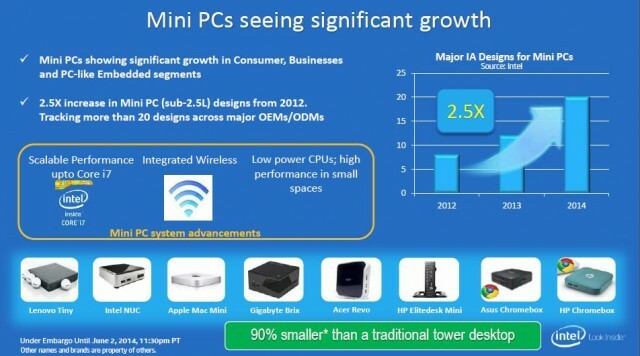 Mini PCs are another form of desktop computing seeing significant growth. Many of the top names in the computer component industry are now offering Mini PCs in one form or another. Even Intel offers one they call the NUC. These mini PCs can support Core i7 processors now days and pack a heck of a punch for such a small device. 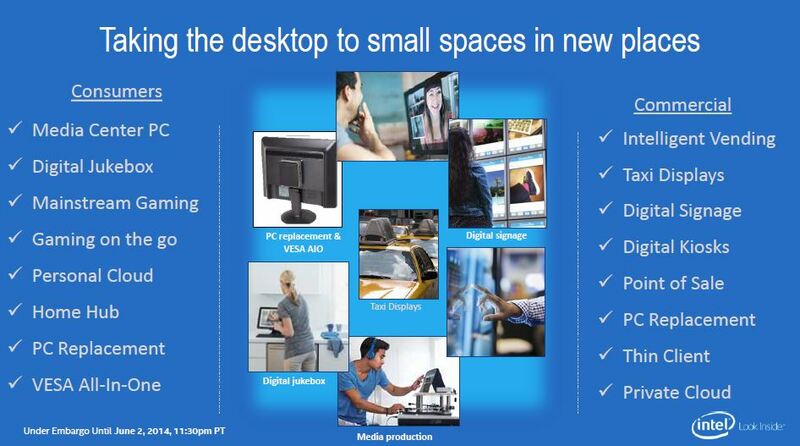 The last slide below lists some of the many uses for a mini PC on both the consumer and business level. 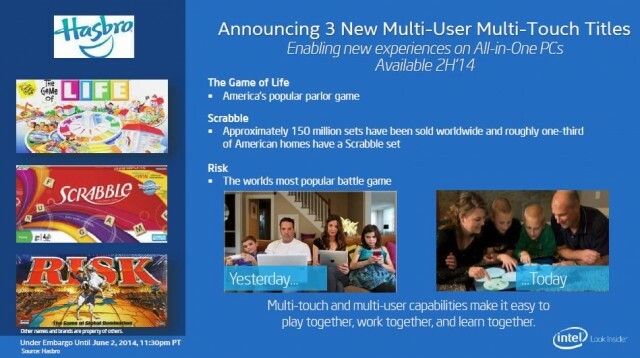 Intel has also been working hard to bring Multi-User / Multi-Touch technology to the AIO desktops. Working with Hasbro, they will offer three longtime family favorite games that can be played by multiple users at the same time. The idea here is to be able to lay your AIO PC or tablet flat and have a group of people gather around to play the game, much like they would with an old-style board game. This technology can extend into business and education uses where close interaction between users is beneficial. 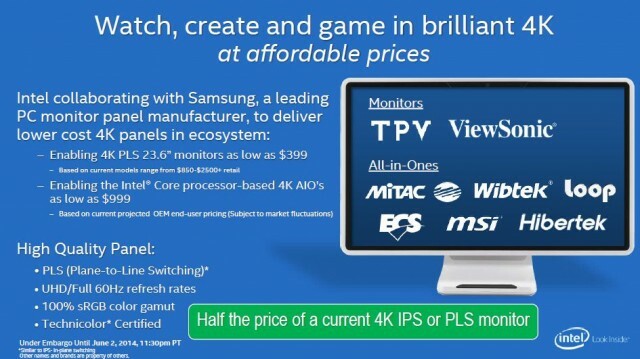 Intel is collaborating with Samsung in an effort to reduce 4K display pricing down to a level more affordable to the masses. In fact, they are hoping AIO units featuring Intel Core processors and 4K displays can be available for around $999 in the near future. 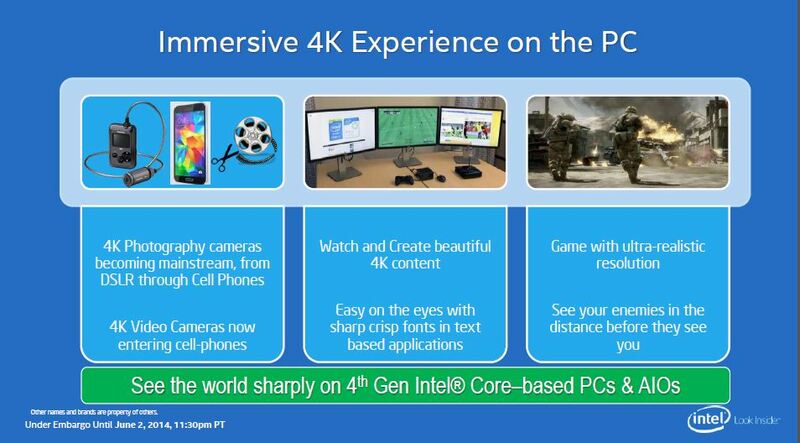 Intel is also said to be working with Samsung to make sub $400 4K monitors a reality. Truth be told, 4K display pricing will probably drop all on its own; but hopefully, this joint effort will speed that process up. Make no mistake about it, the new Devil’s Canyon CPUs are aimed squarely at the gaming and overclocking enthusiast market. 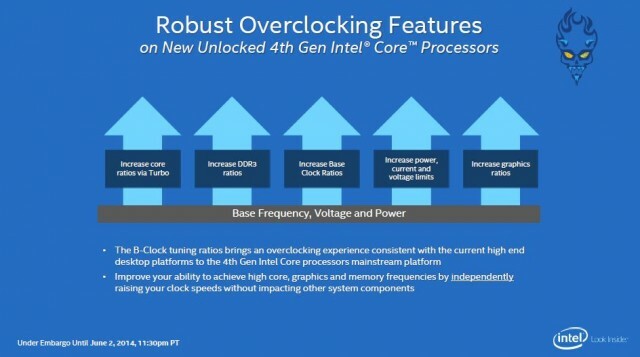 With a base clock of 4.0 GHz (4.4 GHz Turbo), improvements to the thermal design, and additional capacitors for improved power delivery, we should see higher overclocks at lower temperatures. 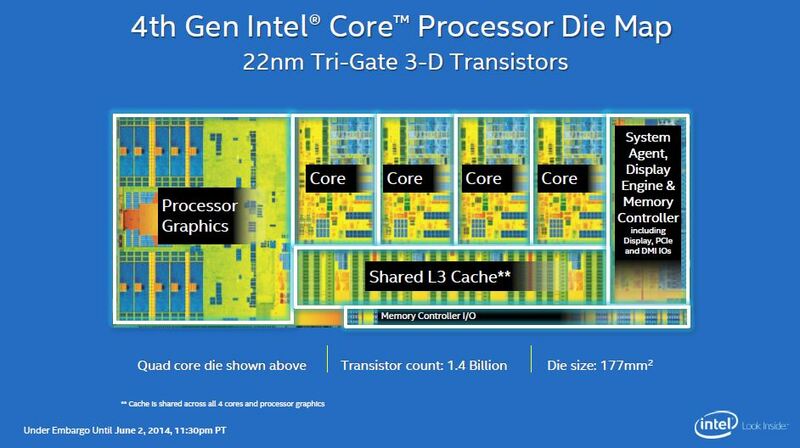 Having a look at the Devil’s Canyon die layout, we can see it remains pretty much the same as the first generation of Haswell CPUs, which is totally expected. We still have a 22nm manufacturing process with a 1.4 B transistor count, and the die size remains at 177mm². 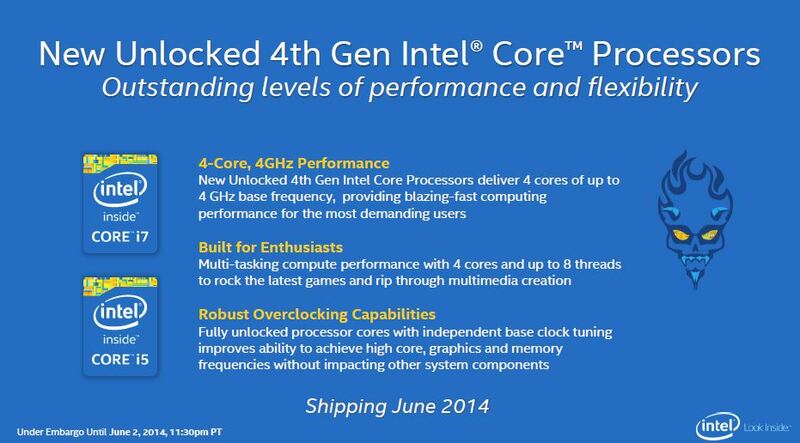 When the Devil’s Canyon CPUs begin to ship in the middle of June 2014, there will be an i7 and i5 iteration available. These will come in the form of an i7 4790K and i5 4690K. 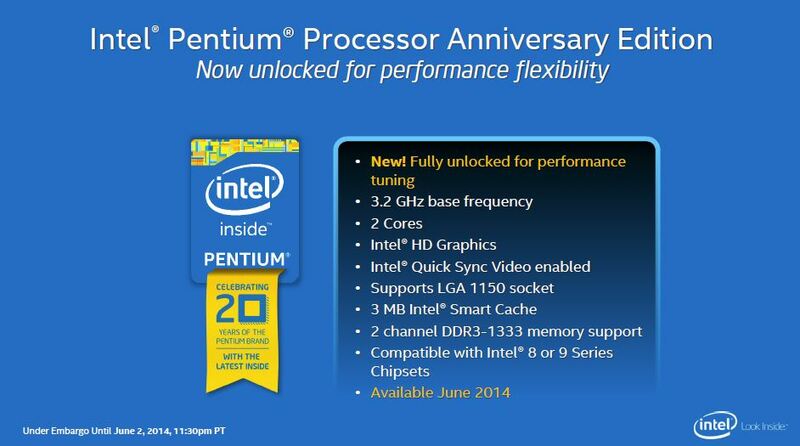 Intel will also be shipping an unlocked Pentium Anniversary Edition dual core processor – the G3258. 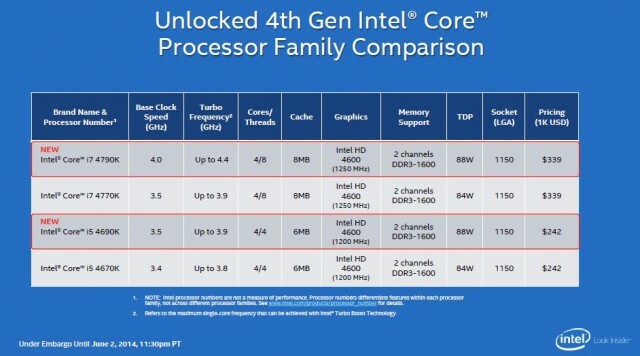 Pricing for the new i5 and i7 processors will stay consistent with with the previously released i7 4770K and i5 4670K, while the Pentium Anniversary Edition G3258 will carry a sub $75 price tag. Faster base clocks with no price increase… we can handle that! 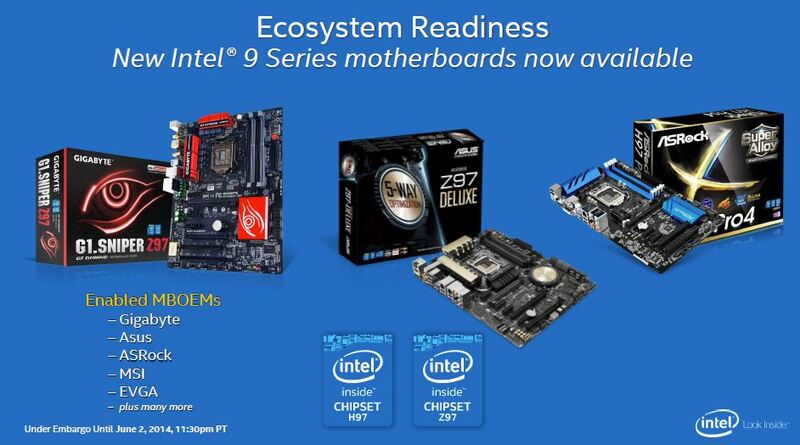 As I’m sure most of you know, Z97 chipset based motherboards are already available from many of the industries manufacturers. We’ve reviewed several Z97 motherboards already and found raw performance similar to that of the Z87 chipset, especially when the same CPU and memory are used. 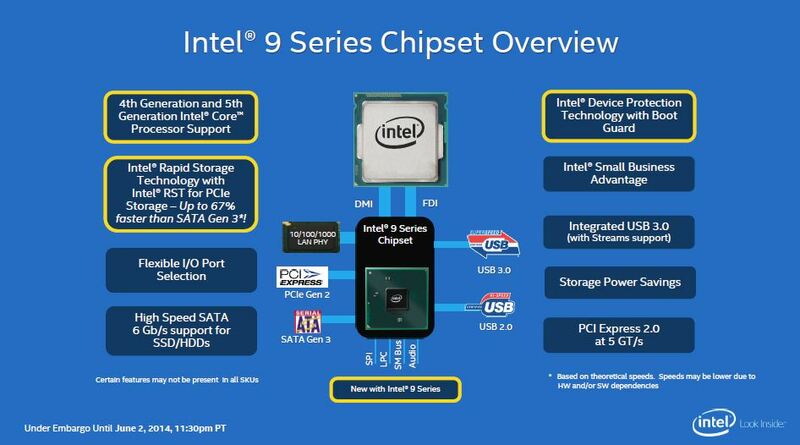 The Z97 chipset does offer a few new features worth mentioning, most notably, native support for SATA Express PCI-E based storage. 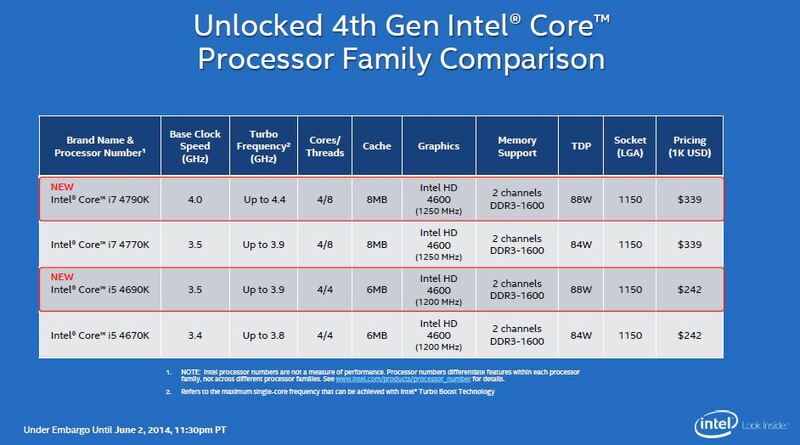 Boot Guard technology and support for all 4th and upcoming 5th generation CPUs are the other two main improvements. 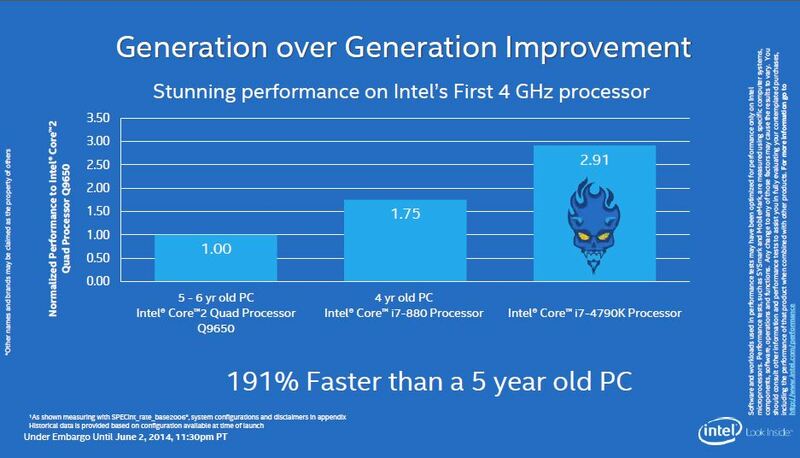 Intel provided us with a couple of additional slides depicting generation over generation improvements. Comparing the i7 4790K Devil’s Canyon CPU against systems built five or six years ago, Intel claims a staggering 191% faster experience. Systems built as recently as three years ago have been topped by up to 39%, depending on the task at hand. Suffice to say, we’ve seen a massive improvement in performance over the past several years. 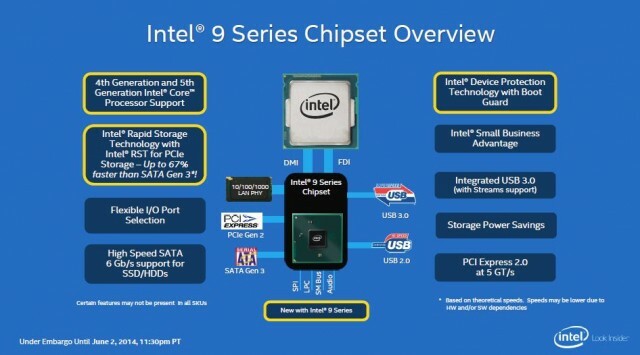 During our teleconference with Intel, the question of compatibility with existing Z87 chipset based motherboards came up. Intel mentioned that Z87 motherboards can be made to support these new processors if motherboard manufacturers are willing to provide BIOS updates to support them. 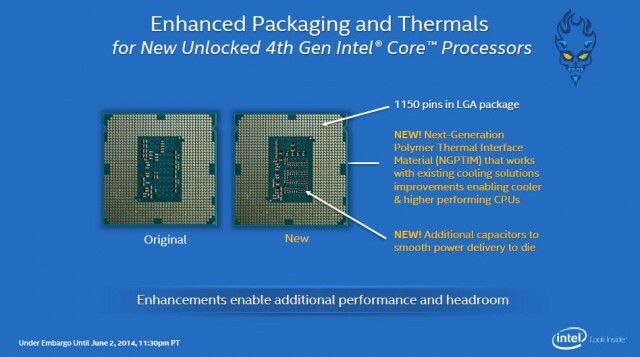 However, Intel was also quick to point out that they highly recommend using Z97 chipset based motherboards to pair with Devil’s Canyon CPUs. Whether or not motherboard vendors decide to pursue Z87 compatibility on a large scale remains to be seen, but an interesting factoid to pass along nonetheless. So, there you have it. 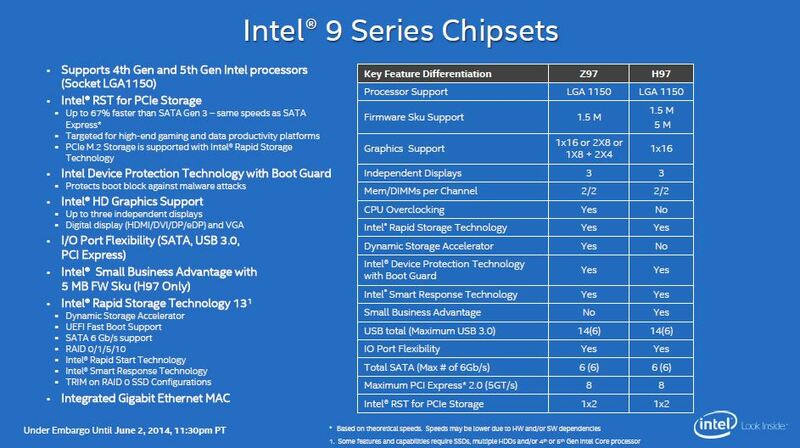 You now know what we know about this latest round of Intel CPUs. As mentioned earlier, once we receive our review sample, we’ll provide overclocking and performance results as quickly as possible. Stay tuned! 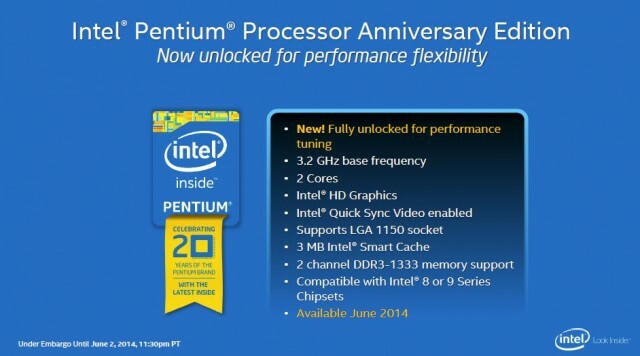 Are you able to confirm the model of the Pentium anniversary edition cpu? i find it being labeled as G3258 on one site. since im not gaming like i use anymore or doing much of anything on my pc. i might be heading towards that cpu but i would like to see a dual core+HT unlocked cpu, to bad this wasn't it. 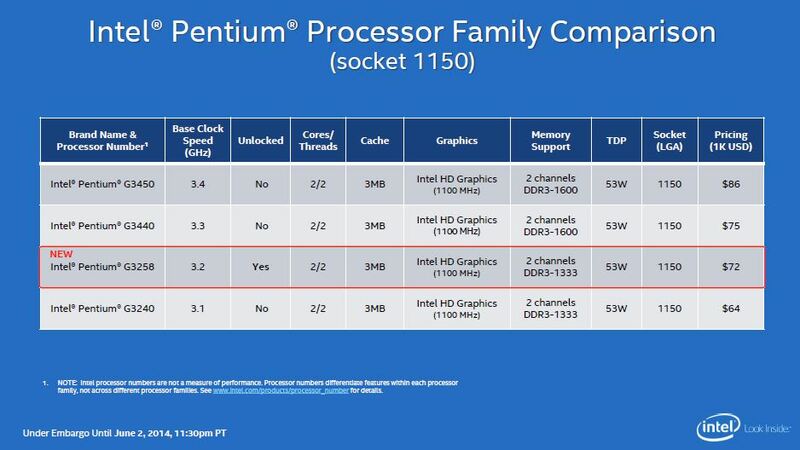 Looking around at other articles, they state the same model number... its also in the slides? Hopefully, delidding may not be necessary. 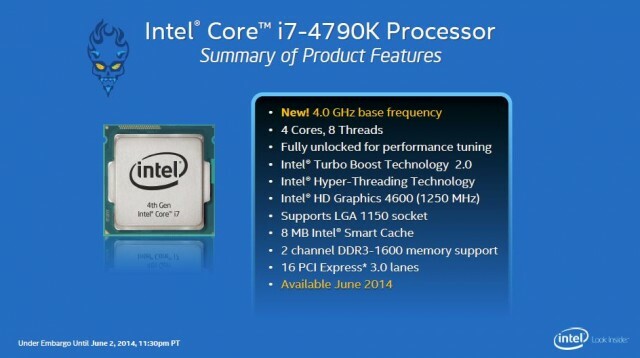 I'm figuring a combo from Microcenter with a 4790k, will run about $400 or so. My wife is going to kill me, lol. Happy that the Pentium G3258 has an unlocked multi! Never expected to see a Pentium with an unlocked multi ever again! so is this the new cpu i was told to wait for, i thought it was coming out in December? i hate falling behind in technology, makes you such a n00b lol. EDIT: did some reading and it's the broadwell i'm waiting for, but is it worth the wait? I'll take a write-off like this any day. Yea man, for $75 that G3258 would be a fun toy to play around with if nothing else. Sadly no AES and some other things but for this price can be nice toy. If they are clocking good and have no other hidden restrictions then it can be good for all 2 core benchmarks. Memory controller is DDR3-1333 but i3 has already shown that they can make 2933 clock. Probably the same as other Pentiums/i3, we can expect only 100MHz bclk strap. No Pentium G3258 demos at Computex, but the Devil's Canyon box they had their today was at 5002 MHz, up from the 4800 is was at yesterday. Same box, same cooler (H80i), same voltage (1.39v) and same idle 33-34C. if just a web surfing pc or slightly lower end gaming pc, why does AES matter? I have had to pinch a bit here, im barly atm able to skate by. I have pre-ordered the G3258, now to pinch some more. either get a AIO H80i or just stick to air cooling. then is the matter of which board to get from Asrock, the mITX board or stay with a mATX FF thus getting the OC formula board. gonna have to do some looking, atm there are no users i can find with either board nor any reviews of either board. I wonder how these will perform, when delidded? I don't there there is much point in doing that. Part of the things they changed is the TIM used. That said, never heard of anyone doing it, but, I wouldn't guess it will do near as much as what some report with the current Haswell CPUs.